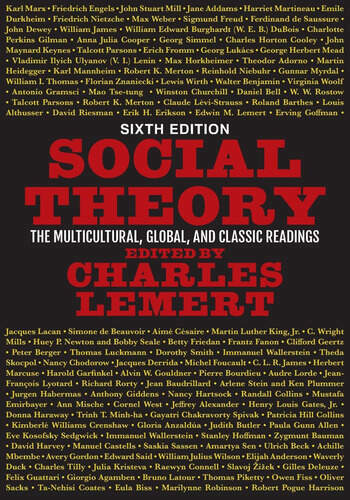 For nearly a quarter-century, Charles Lemert has shared his love of social theory, and the questions it explores, in this collection of readings. With 140 selections that begin in the nineteenth century and end in 2015, Social Theory charts the long arc of the development of the field. This edition retains classic texts by Karl Marx, Emile Durkheim, Max Weber, and W.E.B. Du Bois and writings of major contemporary figures like Audre Lorde and Patricia Hill Collins, while adding pieces from Harriet Martineau, Friedrich Nietzsche, Kimberly Williams Crenshaw, Thomas Piketty, and Ta-Nehisi Coates, among others. Revised and updated with a new section exploring social theory at the limits of the social, Lemert's Social Theory remains essential reading.